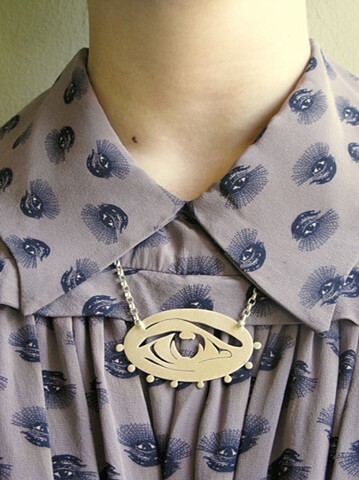 This necklace is a modern interpretation of Georgian and Regency-era (late 18th and early 19th century) lover's eye jewelry, which were tokens worn by lovers who wanted to keep secret the identity of their heart's desire. The trend was started by the Prince of Wales, George IV, who was in love with, and forbidden to marry, a Catholic woman named Maria Fitzherbert. They were also worn as a way to remember loved ones who have passed or a dear friend or family member who lives far away. The piece pictured is my own personal necklace, which is not for sale. Please contact me to discuss ordering your own custom necklace (or brooch!) based on this design.